WASHINGTON (Reuters) - Federal Reserve Chair Janet Yellen wants to see U.S. wages climb at a much brisker clip to boost consumer spending and help workers recoup ground they lost in the last recession, but she'll have to fend off policymakers who fear that could cause inflation to surge. As she seeks to maintain a consensus at the central bank, Yellen will have strong arguments in favor of nursing the recovery for longer and should be able to counter any calls for an early interest rate hike. Research from the Fed's staff and her own past academic work both suggest there may be more slack in the economy than inflation hawks believe, and that businesses in recent years have been slower to raise prices than they were previously. If that is the case, then interest rates could remain lower for longer and inflation allowed to push beyond the Fed's 2 percent target without fear of it losing control. It's a policy Yellen has indicated she is willing to pursue to encourage wage growth and bring as many workers as possible back into the full-time labor market. The connection between faster wage gains and a healthy jobs market is emerging as a core principle for the new Fed chief, who has said she expects pay to accelerate to something close to the long-run growth rate of 3 percent to 4 percent a year from the current level of around 2 percent. "My own expectation is that, as the labor market begins to tighten, we will see wage growth pick up some to the point where ... nominal wages are rising more rapidly than inflation, so households are getting a real increase in their take home pay," she said last week, adding: "If we were to fail to see that, frankly, I would worry about downside risk to consumer spending." Yellen has balanced her concerns over a weak labor market and slow wage growth with a commitment to price stability in the long run. And for now, she contends, there is no tension between the two because there is so much slack in the economy. 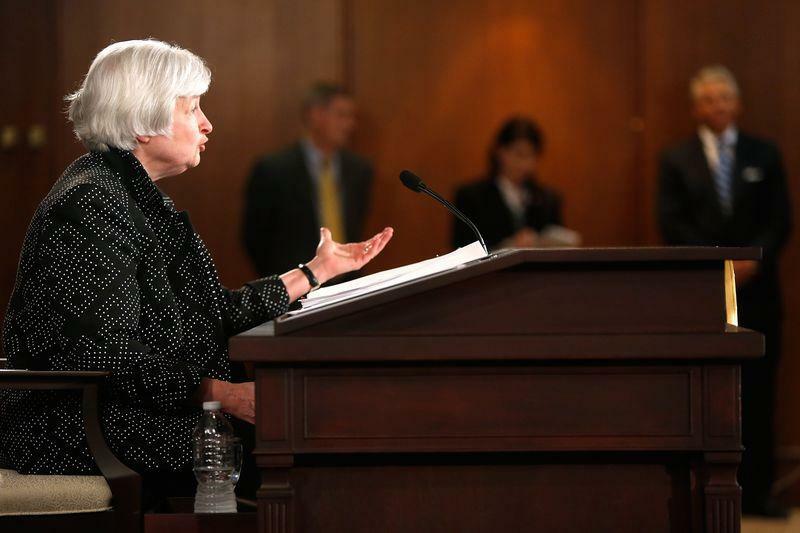 The debate, however, may well test the limits of the Fed's tolerance for inflation. For some policymakers, that limit is already close. In comments on Tuesday, Philadelphia Federal Reserve Bank President Charles Plosser said Fed policy had already become "too passive," and the central bank needed to better explain why another year of near zero interest rates is justified. But it also touches on a fundamental issue: Can the United States again generate the jobs and wages growth needed to support an expanding middle class? Fed staff economists accepted in 2010 that labor's share of annual U.S. output, which over a decade had dropped to around 56 percent from its long-term average of around 62 percent, was unlikely to recover. Before that, the relative stability of labor's share of output had provided a benchmark for Fed forecasters, helping them to anticipate a rise in prices if labor's share of output crept above the norm, or a rise in wages if labor's share was below average. But the financial crisis of 2008-2009 and the painful recovery since then has cast doubts over how wages, prices and employment will play out in the future, clouding the outlook for monetary policy and the potential date for any rate rise. Over the last year Fed staff changed their main model for forecasting wage and price inflation to reflect evidence that companies were adjusting prices more slowly than in prior years. That implies the Fed has more time to allow wages to rise and employment to expand before having to be concerned about inflation accelerating. Yellen's own academic work describes the potential benefits of patience as the Fed approaches its first cycle of interest rate increases in six years. In a 1990 paper, "Waiting for Work," co-authored with her economist husband George Akerlof and another researcher, Yellen discussed how in the wake of a downturn skilled workers might wait until wages recover before returning to the labor force, rather than accept inferior pay. One issue the Fed is closely watching is whether sidelined workers will start looking for jobs again as conditions improve. The labor force participation rate has dropped steadily, from 66.4 percent at the end of 2006 to 62.8 percent last month - a level not seen since the late 1970s when participation rates were rising as more women joined the workforce. Yellen also delved into an issue that has puzzled labor economists - why wages aren't typically cut in a downturn. Her research outlined a number of possibilities, including that companies realize upsetting workers may only cost companies more in the long run as some will quit or become less productive, while rehiring in a recovery will prove more costly. But a flip side is that, as economies recover, firms make up for the lack of wage cuts by keeping worker pay constant for as long as possible. The San Francisco Fed, where Yellen served as president until 2010, tracks the percentage of workers whose wages did not rise in the prior year. The bank's "Wage Rigidity Meter" remains near an all-time high - evidence it will take more time before the type of wage-growth Yellen hopes to see. San Francisco Federal Reserve Bank President John Williams was explicit in a recent paper, saying the Fed "should trade a transitory period of excessive inflation" for stronger job markets. Business owners and analysts in labor-intensive industries paint a muddled picture on the ground of firms that will remain reluctant to hire unless they are jolted to a new level of certainty that the economy will expand and that the incomes of their customers will grow. Restaurants are one of the industries that can pull less skilled and discouraged workers back into the labor force. Industry officials say there is little evidence restaurant wages, staffing levels or revenues are poised for liftoff. Restaurant owners "want to see things shake out," and were being very careful about only hiring when they really had to, said Scott DeFife, government affairs head for the National Restaurant Association. In the building industry, one of the sectors that continues to worry the Fed, entrepreneurs and analysts describe an economy poised for better performance - but lodged in a circular, you-go-first stare-down among consumers, businesses and banks, with the unemployed stuck on the sidelines. Rick Judson, owner of Charlotte-based Evergreen Development Group, said the first-time home buyers his business relies on will remain a reluctant lot until the economy improves. But that may not happen until people start buying more homes. The building subcontractors he hires are similarly on the fence. They see a lack of housing supply, but are unwilling to hire carpenters and electricians in numbers large enough to address it, fearful the recovery might not have staying power. "My subcontractors worry, do I hire four extra people, or hire two with the expectation that I ride it out for a few extra months," he said. "There is a mentality not of fear, but of caution. Extreme caution."